gsettings set desktop.unity.panel systray-whitelist "['all']"
and now I am having all sorts of weird problems with my panel like double icons and stuff, how do I reset this setting to the default setting? 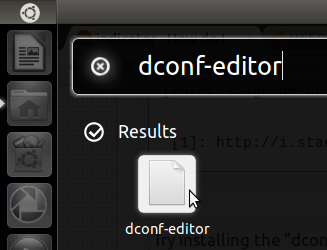 Try installing the dconf-tools from software center. Highlight the whitelist entry as shown in the picture and click the Set To Default button. Log-off and login for the change to take effect. Not the answer you're looking for? Browse other questions tagged indicator or ask your own question. 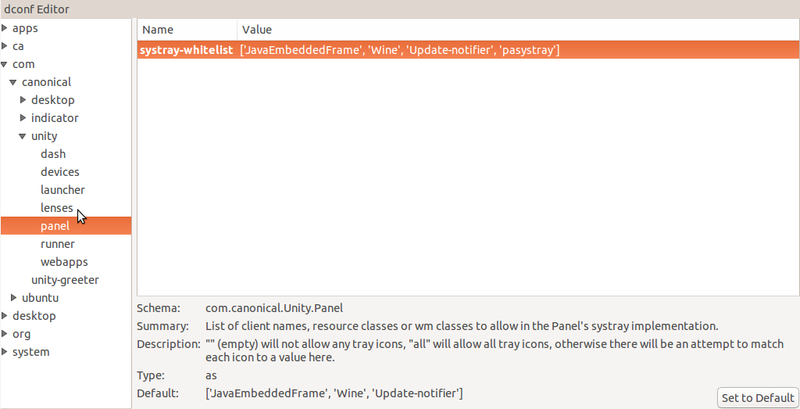 How do I undo the unity panel whitelist? Two battery indicator symbols, how do I get rid of one? How to hide xchat icon from panel? I have an extra power icon in my menu bar. Any idea why? How to re-enable Banshee icon in the older notification area? What network manager to use for the Xfce4 Panel to see my current conection state?